The wedding ceremony is over, the reception was a blast, and the honeymoon was magical but, the wedding still isn’t quite over. There is one last thing to do in order to complete your big day, and that’s sending out the thank you cards. It may sound simple, but this one aspect of your wedding is something you certainly don’t want to overlook or forget. Before you send them out, here is a list of wedding thank you card tips to help you streamline your thank you cards and make them memorable for your guests. When it comes to planning your thank you cards, the sooner you start, the better. Ordering your thank you cards at the same time as your invitations and other wedding stationery can help save your time and money. It also allows you to match your thank you cards to the rest of your wedding theme. A lot of wedding planners recommend making a copy of your invitation list, and your gift registry. That way everyone’s information is readily available and on hand. Time is of the essence, so it is considered polite to mail out thank you cards within two weeks of the ceremony. A great way to save some time is to order pre-addressed envelopes, this way you only have to write one address per envelope. Also, print the cards, but write the message yourself. Handwritten notes are much more personal and will show your guests that you have taken the time to thank them personally. 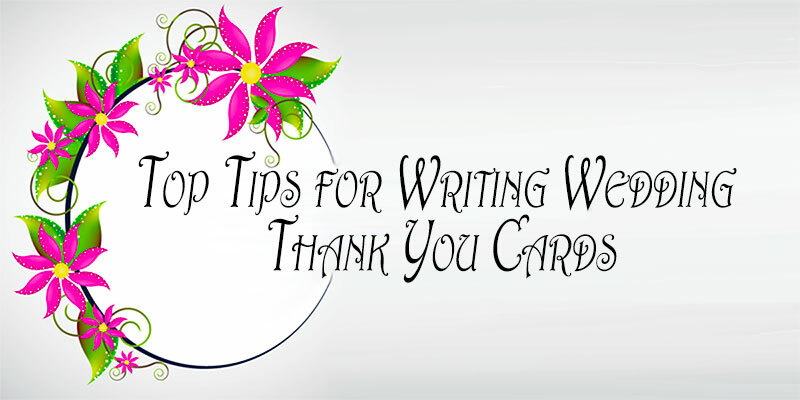 When you are writing the “thank you” message on the card, make sure to address each person by name and sign it from both of you. Just make sure to mention what you are thanking them for, i.e., attendance, gift, best wishes, etc. These little personal touches can make all the difference! Make sure to send a thank you card to everyone who attended, gave gifts, and to those who sent best wishes. You may even want to go as far as to send a thank you card to the vendors and staff that helped make your wedding a memorable day that will live on in your memories forever.